This year, three astronomers were awarded the Nobel Prize in physics for discovering a bizarre aspect of our universe that gave rise to the concept of dark energy. In 1998, two teams independently discovered that the expansion of the universe was not slowing down or holding steady, as expected, but speeding up. 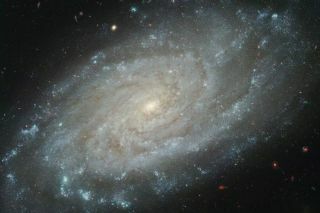 One team was led by Brian Schmidt of the Australian National University in Canberra, Australia and Adam Riess of the Space Telescope Science Institute in Baltimore, Md., and the other was led by Saul Perlmutter of Lawrence Berkeley National Laboratory in Berkeley, Calif.
To explain this perplexing finding, astronomers conceived an entity called dark energy that's essentially counteracting the force of gravity to pull the universe apart. SPACE.com spoke to Schmidt after his Nobel win to find out more about the weirdness of our universe, and what it feels like to win the world's most famous science award. Schmidt, an astronomer on faculty at the Australian Naitonal University, shares the 2011 Nobel Prize in Physics with Saul Perlmutter and Adam Riess. How did you find out you'd won the Nobel Prize? Well you get a call, in my case, 15 minutes before the announcement. So at 8:30 on Tuesday night here in Australia, I received a call from a woman with an impeccable Swedish accent. I have graduate students who like to play jokes on me, so I was thinking, wow, they did a pretty good job on this one. But they told me it was a very important phone call and they wanted to make sure it really was Brian Schmidt they were talking to, and then members of the committee come on and read their announcement, and congratulate you. In my case, I'm a wine-maker, and they asked me about my 2011 vintage of wine, and then they asked me whether or not I'd be willing to go live at their announcement in seven or eight minutes to tell the world what I'd done. Well, I kind of went weak in the knees. And I got a little queasy, 'cause it's just so intense, it's so amazing. You're excited, but you're kind of scared at the same time. How do you think the Nobel Prize will change your work? Will it bring more opportunities? From my perspective, if you're in a country like Australia or the United States, it brings a huge responsibility to ensure that people understand why science is important to society. And Nobel Prizes are just such an amazing opportunity to highlight everything that science brings to our civilization, and how it's taken us to a level of prosperity that I think we all take for granted. When you began this project back in 90s, did you ever think it might lead to a Nobel prize? Although that as a big project, it wasn't one that was going to win a Nobel Prize, no matter what we measured. But it was an important thing to measure, at least from an astronomy point of view, the future of the universe. Was it going to expand forever, or was it going to eventually halt in its expansion? So, a fundamental question about the universe, but I have to admit the idea of winning a Nobel Prize about it just wasn't on the radar. When you saw the first indications that the expansion of the universe was accelerating, how long did it take for you to believe your results? Adam Riess sent me a preliminary preview at the end of 1997, and when I saw it I just assumed we made a mistake and it would go away. Was it gratifying that the other team led by Saul Perlmutter found the same thing? I was surprised because one of the reasons I was so worried back in the end of 1997 was because preliminary results from the Supernova Cosmology Project were saying not that the universe was speeding up, but rather that the universe was slowing down and slowing down quickly. And so it's one thing to have a crazy result, and it's another thing to completely disagree with the other team doing a very similar experiment. So yeah, it was a little reassuring to see that we were getting the same thing once we found out about each other's results. Do you think dark energy is the explanation behind this acceleration? It's definitely hard. We are guessing that the universe is filled with energy, that's our best guess. We're getting the Nobel Prize, not for dark energy — we're getting it for seeing the accelerated expansion of the universe. And so while I don’t think we're absolutely sure it's dark energy, I think that's the best explanation. But it could well be something even more exotic. The fate of the universe looks pretty bleak. The universe is going to expand faster and faster over time and the reality that we see now will eventually fade away from view. It will be so far away that we won't be able to see its light anymore. And so, while our own galaxy and a couple of other nearby galaxies will sort of merge together to form some super-galaxy, all the stars will eventually die because they run out of nuclear fuel, so we'll have a bunch of burned out embers surrounded by a sea of nothingness. Do you find that depressing? It's certainly sobering. It's certainly not the way I would have chosen for the universe to end. But, you know, the universe does what it wants, and I'm just here to figure out what it's doing. I can't judge it. What inspired you to become an astronomer? My father was a biologist. My parents had me when they were very young, so I remember my dad starting a PhD., and I remember my dad finishing a PhD. I remember having science around me from a very young age. I always wanted to be a scientist. I became interested in astronomy when Comet West came by in 1975. That comet made me realize that the sky was interesting to look at. My dad bought me a very inexpensive telescope that I could look through.